Climatologists and environmental scientists expected El Nino to appear over the winter of 2014-'15 and, though it never officially did, it appears it was only tardy, not absent. As we head into summer, NOAA has now indicated that a weak but strengthening El Nino is present and could become one of the strongest in quite some time later this year. In fact, NOAA is forecasting a higher than 80% chance that El Nino will continue through the remainder of the calendar year. Sea surface temperature anomalies (departure from normal - orange to red above normal) increased over the past 3 months in the El Nino region from the west coast of South America into the central Pacific indicating a strengthening El Nino. 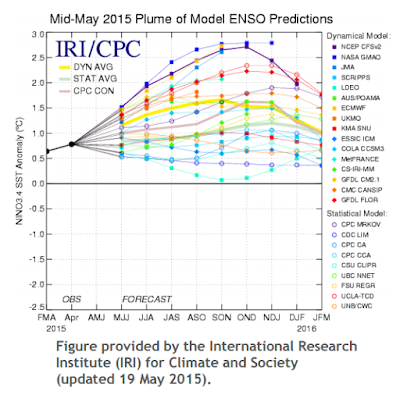 The various long-range computer models almost all support a strengthening El Nino this year with some indicating it could become very strong. El Nino's effects on winter weather are fairly well documented and understood (though local variations certainly exist and no two El Nino patterns are the same) but the effects in summer tend to be more muted and less predictable. There have also been many fewer instances of a strong summertime El Nino in recent decades, thus there are fewer cases to look back to and draw conclusions from. 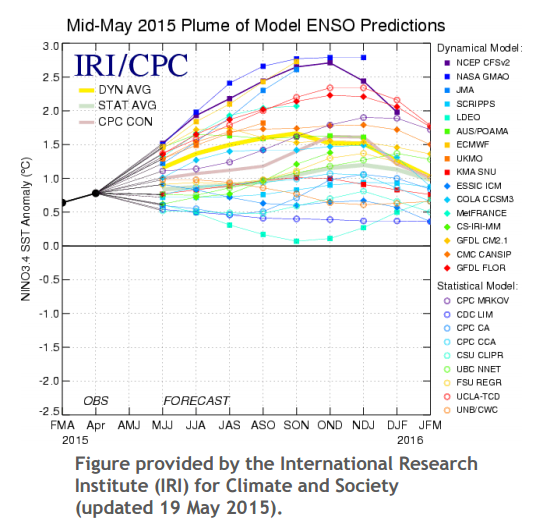 So how will this summer's El Nino affect the Mid-South? Dr. Jeff Masters, who writes on Weather Underground's Wunderblog, recently discussed the same topic and recounted the effects of two similar cases in particular, the summers of 1982 and 1997. Both of these summers were generally cool and wet across a large part of the continental U.S. 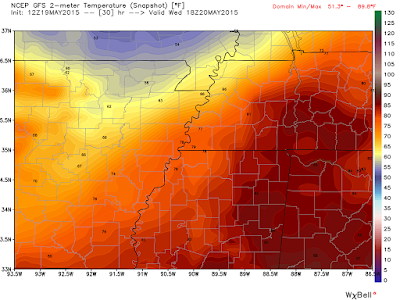 Both of these summers were slightly below normal temperature-wise in the Mid-South as well. 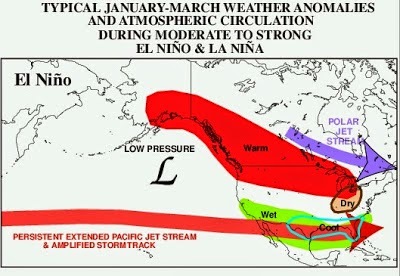 El Nino also tends to bring wetter than normal conditions to the southern U.S. owing to a persistent subtropical jet stream. 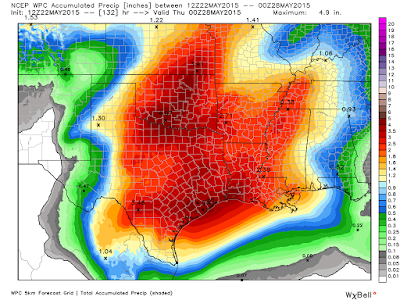 Masters indicates that "signals remain positive for widespread summer moisture." In fact, NOAA's June-August climate outlook shows the Mid-South on the eastern periphery of a large area of cool and wet conditions that they believe will dominate the central U.S. So, despite short-term trends that indicate a warmer-than-normal start to June, the summer average could end up a bit cooler (not to the exclusion of some periods of hot weather that we know are in store!). The June-August temperature trends (left) as forecast by NOAA indicate a better than even chance of cooler than normal temperatures across the central U.S. with the western part of the Mid-South possibly cooler than normal. Precipitation-wise (right image), a large part of the Rockies, central, and southern U.S. could be wetter than normal, including the Mid-South. It's also worth noting that there tends to be a marked decrease in Atlantic tropical activity during El Nino summers as well, owing to increased storm-destroying wind shear in the favored tropical formation regions. However, that could be partially offset by elevated sea surface temperatures (SSTs) in the Gulf of Mexico and Caribbean. So while the overall pattern could be quiet this year, it only takes one storm to feed on higher than normal SSTs near the U.S. to cause big problems for coastal residents. Tropical outlooks for 2015 that have been issued so far have indicated a below normal season. 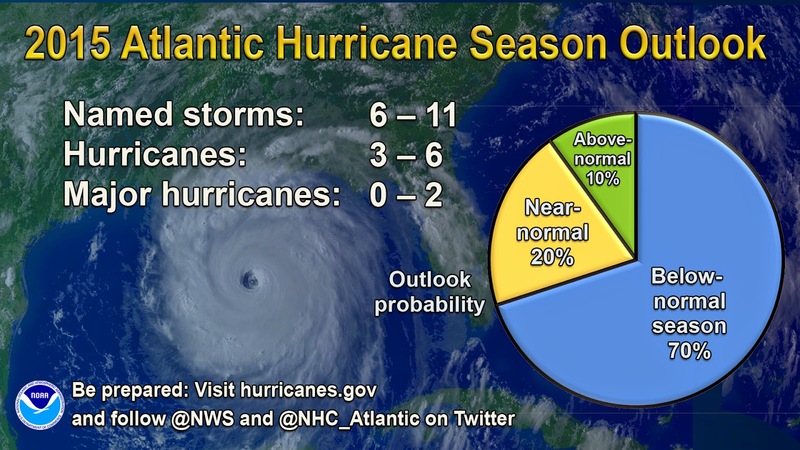 NOAA's Atlantic basin outlook, released May 27, calls for a 70% chance of below normal activity due to El Nino. More specifically, NOAA predicts 6-11 named storms, 3-6 hurricanes, and up to 2 major hurricanes. We'll see how the summer plays out - it will definitely be interesting to monitor! 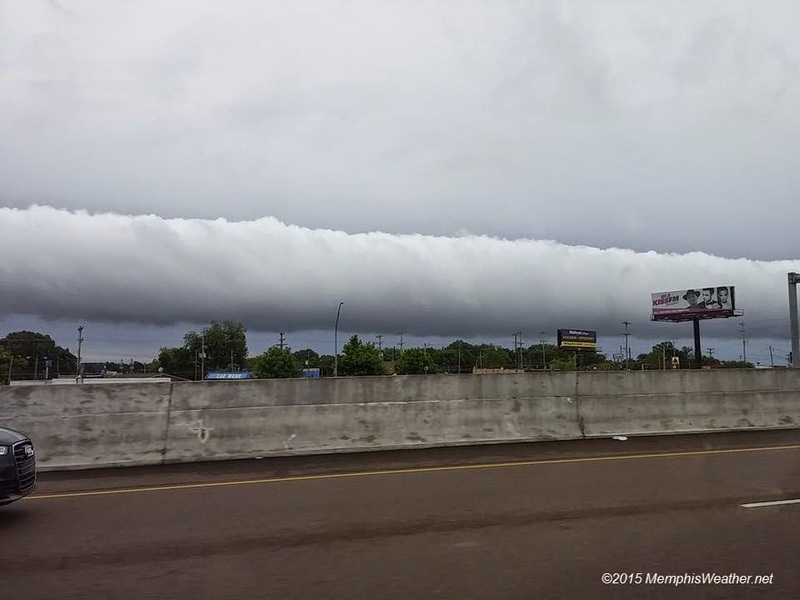 "A low-level, horizontal, tube-shaped arcus cloud associated with a gust front of a convective storm (or occasionally a cold front). Roll clouds are relatively rare; they are completely detached from the convective storm's cloud base, thus differentiating them from the more familiar shelf clouds. Roll clouds appear to be 'rolling' about a horizontal axis [similar to a tornado on its side] because of the shearing effects and horizontal vorticity [rotation about a horizontal axis] provided by the differing air masses." Roll clouds and shelf clouds (which are much more common and we have seen regularly lately as storms move into the area, pushing an outflow of cold air from the parent storm out ahead of the storm) are both of the arcus variety. The difference, as noted above, is that shelf clouds are attached to the parent storm while roll clouds are completely detached from other clouds. 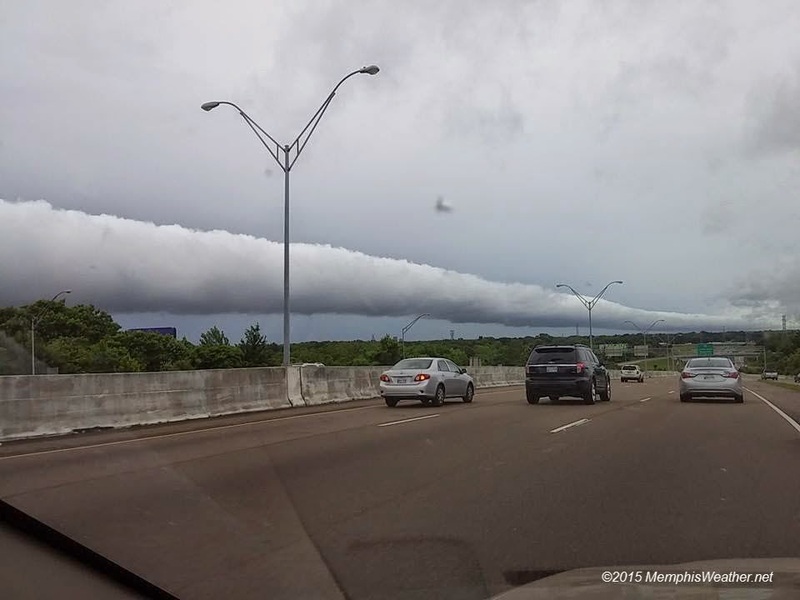 In this case, the roll cloud likely originated as a shelf cloud from the squall line of storms that moved into central AR last night before falling apart. The outflow from the storms continued, and with no "parent storms" to attach to, the shelf cloud likely became a roll cloud. The fact that it made it this far east is fairly impressive! A comparison of the two types of arcus clouds, from Ecography.com. Roll clouds are most common in the U.S. along sea breezes and coastal locations, but are most likely (and more easily predicted) in Queensland, Australia, where they are referred to as the Morning Glory. (Check out this link for more on the Morning Glory and impressive pics!) We happened to luck out with one overhead this morning! Don't ever miss an opportunity to look up - you never know what you'll see! The first round of Memorial Day weekend storms moved through the region yesterday afternoon into the early overnight hours. A Tornado Watch was issued for the Mid-South until 10pm last night, but fortunately only scattered reports of wind damage were reported across the area. The bigger issue for some was heavy rainfall. 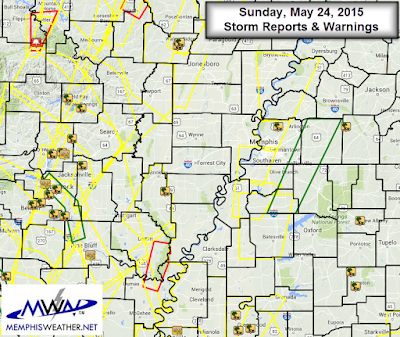 Most afternoon and evening storms were scattered or fairly transient so no widespread flooding issues resulted. However, late in the evening, a north-south line of storms moving basically due north set up from Memphis south roughly along I-55. It took some time to slowly move east and weakened to general rainfall during the overnight hours. A Flash Flood Warning was issued for the eastern metro and Doppler estimated storm total rainfall amounts were in the 2.5-4" range within that warned area. 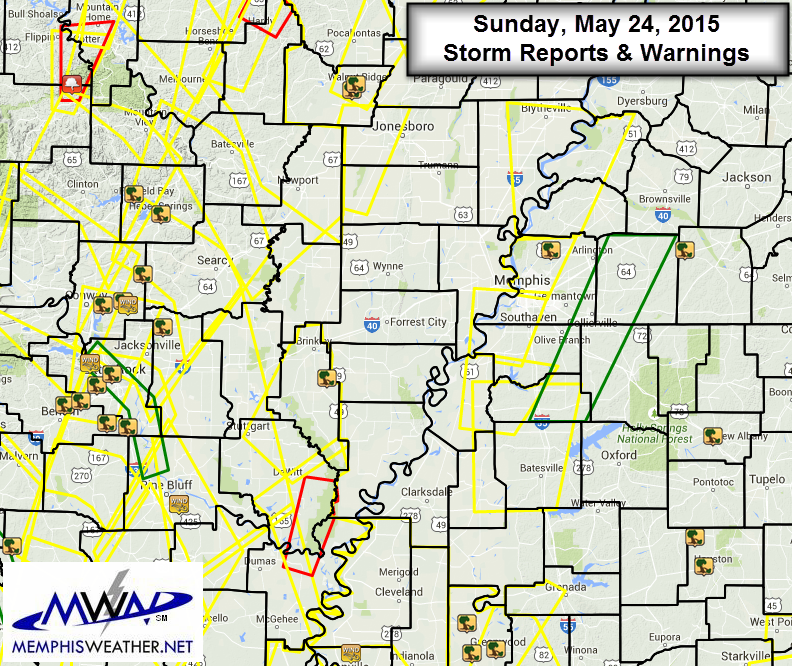 Scattered damaging wind reports were received across the region (yellow/green icons above) with most activity concentrated west of the metro closer to Little Rock. 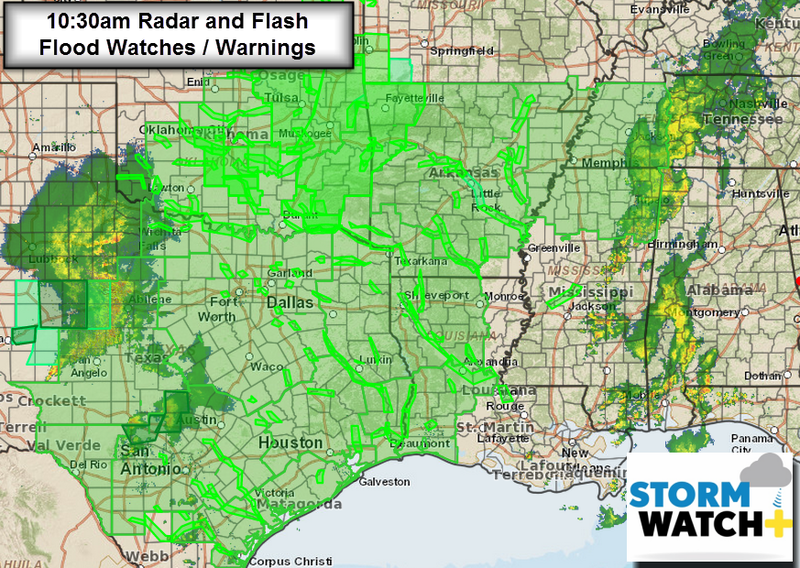 Yellow boxes are Severe Thunderstorm Warnings issued, green is Flash Flood Warnings, and red boxes are Tornado Warnings. 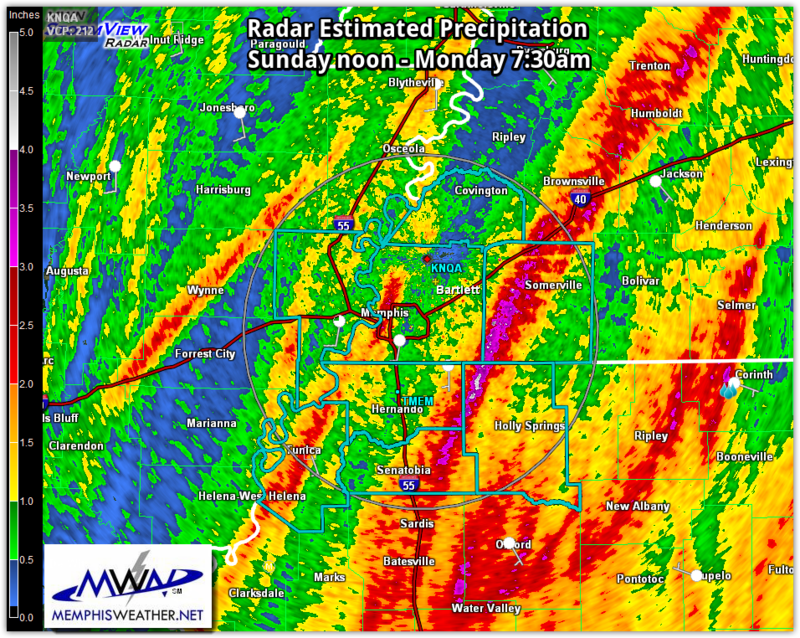 Doppler estimated rainfall totals for the Sunday/Sunday night event. The storm tracks with heaviest rain can be easily picked out as they moved north-northeast. Pink colors are >3" amounts. We'll get a reprieve today for the most part, though a few scattered showers can't be ruled out. This should allow most picnics and ceremonies to be unaffected by precipitation, although it will be breeze and muggy with highs in the mid 80s this afternoon. 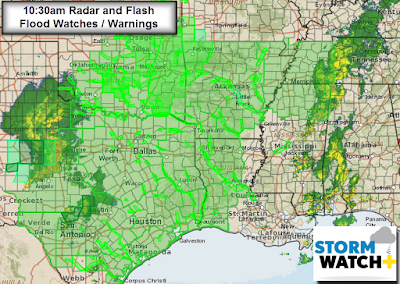 Flash Flood Watches cover much of the southern plains and Mid-South with Flash Flood Warnings across much of OK and along rivers and streams across OK, TX, AR, and LA. By this evening, another round of storms is expected. Driven by another upper-level impulse, these storms will likely bring many reports of large hail, widespread damaging wind, and a few tornadoes to eastern TX and southeast OK today before moving east-northeast across AR and into the Mid-South overnight. Fortunately, the storm system will weaken considerably as it draws closer, but expect more potentially heavy rainfall and lightning after midnight tonight into Tuesday morning. 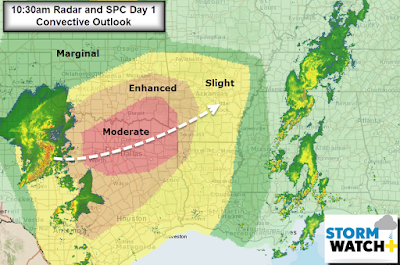 Monday severe weather outlook from the Storm Prediction Center and the general track of a developing storm system in west TX that will move into AR overnight and weaken. 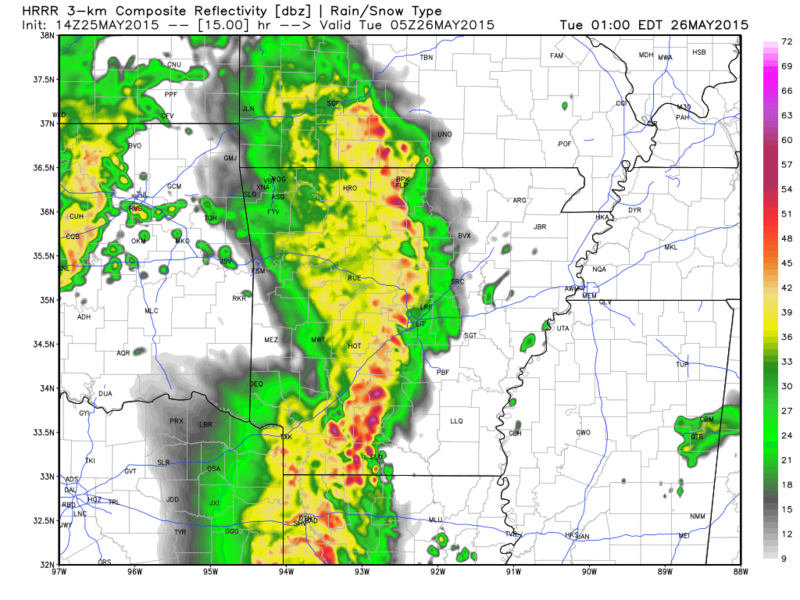 High-res model simulated radar image valid at midnight showing the line of storms that will be moving across across AR. Line placement is approximate and one model's interpretation. This line will be in a weakening stage, likely reaching the MS River in the wee hours or near dawn Tuesday morning. The remnants of the overnight system will affect us Tuesday morning, then there is a chance that storms could re-fire over the area Tuesday afternoon. This will be largely driven by how much rain is still around in the morning, as morning showers and clouds will help to stabilize the atmosphere and keep afternoon storms from forming. 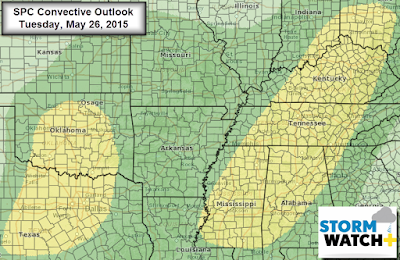 The SPC convective outlook for Tuesday shows a Slight Risk of damaging wind or large hail mainly east of the MS River. Heading into the latter half of the short work week, the Mid-South enters a more summerlike pattern, with fewer organized systems like early this week. Scattered showers and t'storms will be expected during peak heating in the afternoon and early evening hours as temps reach the mid to upper 80s with moderate humidity levels and southerly flow off the Gulf of Mexico. 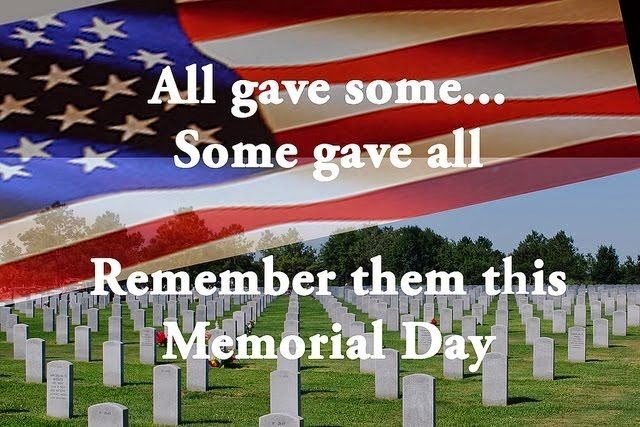 To close, on this Memorial Day holiday, I simply say "thank you" to all of those past and present who have fought bravely to ensure the freedoms that we too often take for granted and God bless the families and friends of those who have lost their brave loved ones in the battle. You are not forgotten. Memorial Day weekend forecast - a little something for everyone! There's a famous saying that is used in many places around the country but is also particularly applicable here in the Bluff City: "If you don't like the weather, stick around - it'll change." WxBell graphic showing temperatures at 6am CDT today with widespread cool weather across much of the U.S. except the southern periphery. 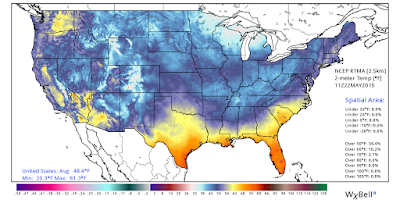 Two-thirds of the nation was below 50 at that time. Click for larger image. Today, temperatures are rebounding nicely with sunny skies, dry (low humidity) air, and easterly flow around the high bringing temps into the mid 70s. 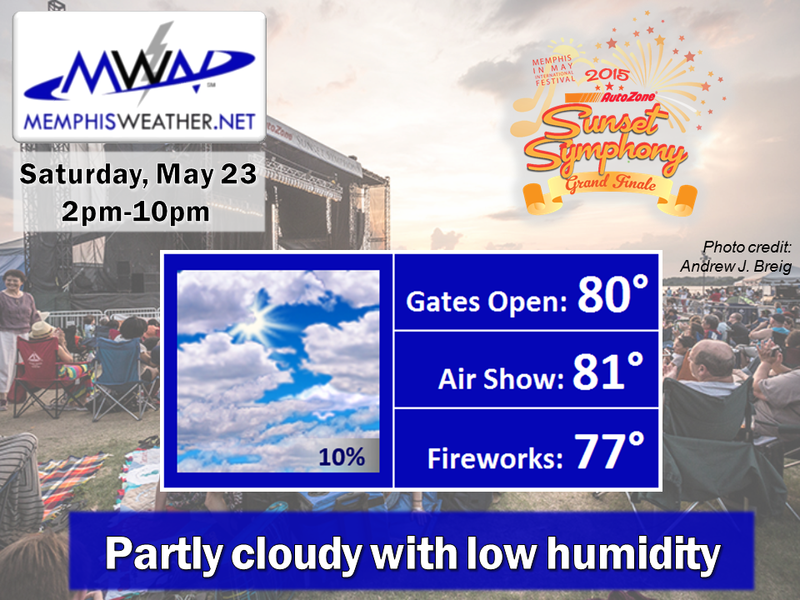 Today is a transition day as even warmer air arrives from the south as the high pressure moves east, resulting in low 80s on Saturday for the grand finale of the Memphis in May AutoZone Sunset Symphony, of which MemphisWeather.net is proud to be the Official Weather Partner! Fortunately, humidity will remain low, but sunscreen will be a good idea if you plan to be at Tom Lee Park, or outdoors for any length of time elsewhere. By late Saturday night, a warm front will move north across the region and bring a small chance of rain or a t'storm. On Sunday, we'll be back in the "warm sector" with humidity back to late spring levels (dewpoints in the mid 60s), a chance of t'storms, and highs in the mid 80s. The GFS model showing precipitation totals for Sunday afternoon indicates scattered t'storms will be a factor, but it won't be as wet as areas to our west. The system responsible for higher precip amounts to the west will move into our area Sunday night into Monday, promising higher rain chances. Graphic courtesy WeatherBell Analytics. Unfortunately for those who have seen enough rain of late, this pattern sticks around for much of next week it appears. Daily rain chances in the 40-60% range will occur beginning Memorial Day (have a plan B for your grill-outs and picnics) and lasting at least the first half of the week. Highs will be in the 80s, lows near 70, noticeable humidity, and southerly wind. No severe weather is currently expected, though upper-air impulses that can't be timed just yet could serve to intensify precipitation somewhat during the first half of next week. Also of some concern will be rainfall amounts as daily storms could result in flash flooding at some point next week - just in time for the kids to be out of school and summer fun to start! The NOAA Weather Prediction Center's rainfall forecast through Wednesday. Another very wet several days across the rain-soaked Southern Plains into the Mid-South! Stay tuned and we'll keep you posted on any threat you need to be aware of. Be sure to always get the latest via our social media feeds and MWN mobile app as well. All pertinent links can be found below. A weather pattern typical of Memphis - in May! After a beautiful day with plenty of sunshine and slowly falling humidity, we will see a return of wet weather tomorrow associated with our next weather system. Clouds will increase tonight due to an approaching warm front while tomorrow scattered showers and thunderstorms are possible, especially in the afternoon as surface moisture increases. By Thursday the low pressure system will be departing the area and temperatures and dew points will fall accordingly. Towards the weekend rain chances will return (including possible impacts on the Sunset Symphony), but first lets get into the forecast details for the work week. The surface weather forecast from the Weather Prediction Center shows chances for showers and thunderstorms in the metro during the day on Wednesday associated with the low pressure system to our west and approaching warm front to our south. You will want to have an umbrella handy during the day though rain chances will decrease as we head into the evening as the low pressure swings through the Mid-South. Precipitation won't be our only threat with this system, as we will have a fairly significant temperature gradient set-up on Wednesday between the separate air masses. Temperatures could be pushing near 80 in Memphis while in northeastern Arkansas they could be as low as the upper 50's, according to one weather model. Very nice weather is expected behind tomorrow's system. During the day on Thursday we will struggle to reach the mid 70's and as we head into Thursday night temperatures will dip into the upper 50's! Friday will be a gorgeous day as well with partly cloudy skies, temperatures in the upper 70's, and relatively dry air. 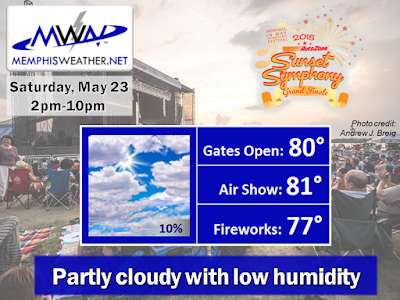 As we approach the weekend, rain chances will begin to increase, starting with a chance of an isolated thunderstorm Saturday afternoon, which could impact the final Memphis in May Sunset Symphony at Tom Lee Park (but we're hopeful it won't!). However, scattered showers and thunderstorms are expected Sunday as warmer, more humid air makes its way into the region. You can get the full updated forecast on the MWN website or in our mobile app with customized StormWatch+ alerts (link below). The cold and wet February/March period turned to warm and drier the first half of April, then shifted to a cool and dry period the last couple of weeks of the month. There were a few rounds of thunderstorms in the metro, but severe weather was again (like March) below the typical pace. 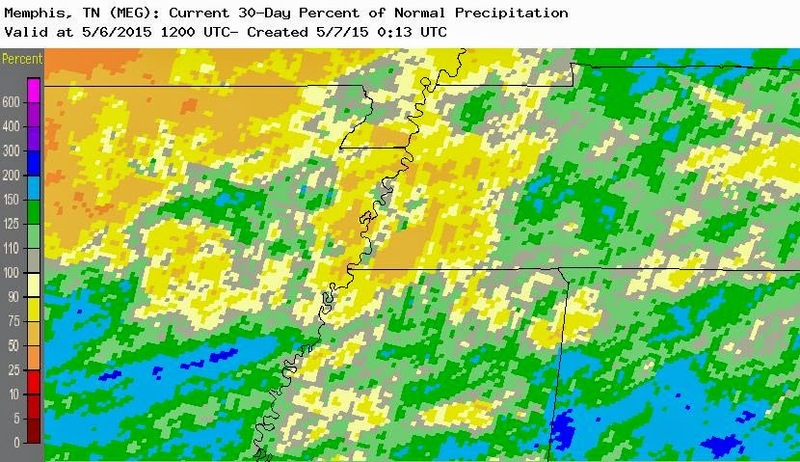 Rainfall was below normal, leaving Memphis International Airport with a year-to-date deficit of 4.83", or about 75% of normal. Through April 30, year-to-date temperatures are just over 2 degrees below average. Comments: Though the number of days with rainfall was slightly above normal, the total precipitation was only 56% of normal as there was only one day with more than 1/2" of rain. After four months with no thunder reported, April saw the beginning of storm season with four days on which thunder was reported. Afternoon t'storms described below now look very unlikely as morning storms and rain serve to stabilize the atmosphere prior to the cold front's arrival. A few storms early this morning may be strong with wind gusts to 40-50 mph and lightning the greatest threats. 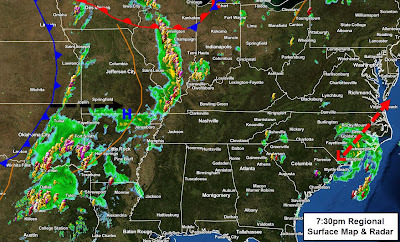 A couple of weeks of dry weather is over as we have entered a stormier pattern this weekend with a couple of systems, remnants of big thunderstorm complexes in the Plains, moving through the region. The system responsible for multiple days of severe weather to our west, including tornadoes, large hail, wind damage, and record flooding, will move through the Mid-South tomorrow. Actually, the front associated with the low pressure system will move through, but the low itself will move well to our north. This is good news as it means we won't be dealing with nearly the severe weather threat that the southern and central Plains experienced the past few days. However, there will still be some decent instability in place, plus lifting created by the front will mean a chance of some severe storms Monday afternoon. The evening setup shows showers and t'storms ahead of the cold front in the Plains that sweeps through the Mid-South tomorrow. Also notice the remnants of Subtropical Storm Ana in North Carolina, which will move northeast with no effect on our weather. Starting tonight, a few scattered showers will be possible throughout the night and then the remnants of severe storms to our west will once again move into the area early Monday morning. Most of this activity will be just rain though some thunder will be possible as well. 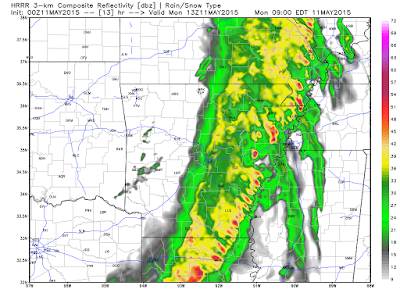 No severe weather is anticipated early Monday. It will be another very warm, muggy night with lows only near 70. An evening run of the high-res HRRR model shows an area of showers and embedded thunderstorms at the river by 8am Monday. Note that this is ONLY A MODEL and actual radar may vary considerably from this model representation. A lull in the precip is expected once morning showers move out, likely from mid-morning to early afternoon. During this time, some sunshine will push temperatures into the lower 80s, creating instability as the main cold front moves across Arkansas. The front will move across the region during the afternoon hours. As mentioned above, the best dynamics associated with the low pressure system will be well removed from our region, but the lift generated by the front in an unstable airmass will likely spark scattered thunderstorms as it moves through. These storms will be capable of producing some strong wind gusts and perhaps some hail. The tornado risk will be very low. Due to the possibility of a few strong storms, the Storm Prediction Center has placed the region (in fact a very large area from the Great Lakes to Texas) under a Slight Risk (category 2 of 5) of severe weather tomorrow. A very large Slight Risk (category 2/5) area is forecast from the Great Lakes to Gulf Coast tomorrow, indicating the breadth of the front that will move through the Mid-South during the afternoon. 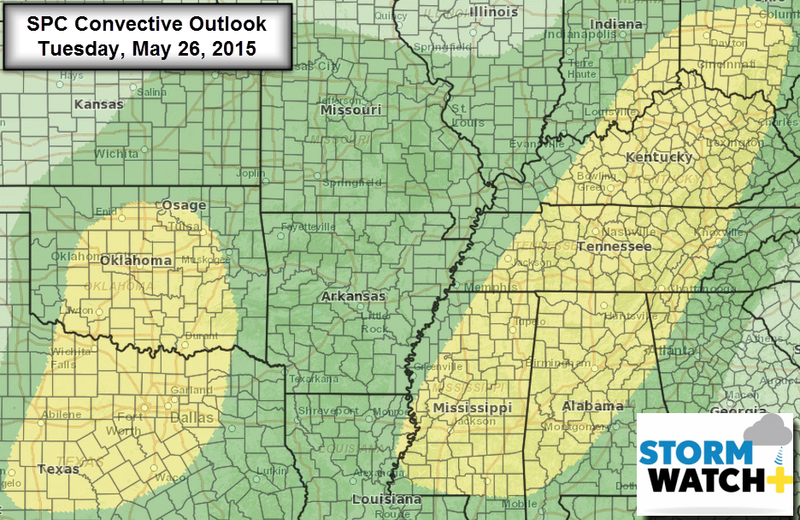 Damaging wind and hail will be the main risks with any storms. By evening, the front will be to our east and slightly drier air will be filtering in as temperatures fall through the 70s. No precipitation is anticipated Monday evening. By Tuesday morning, lows will be as cool as we've seen in several days, around the 60 degree mark. Tuesday looks very pleasant with highs in the upper 70s and much lower humidity (dewpoints in the 40s vs 60s of this weekend). Another dry and pleasant day is on tap Wednesday with morning lows in the 50s, highs near 80, and low humidity. 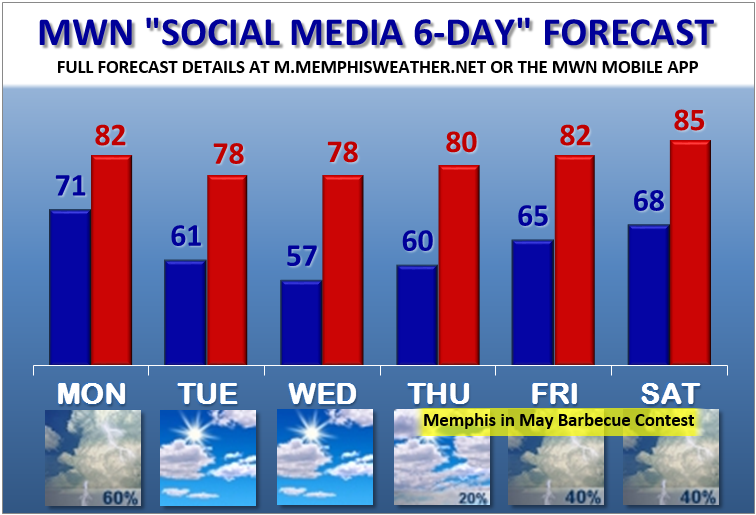 Thursday will be a transition day as southerly wind returns, bringing increasing humidity levels and warmer temperatures back in the 80s as the Memphis in May World Championship Barbecue Cooking Contest gets into full gear. To start the weekend, Friday and Saturday look to be unsettled once again with daytime showers and thunderstorms, higher humidity, and temperatures in the 80s. No severe weather is anticipated late this week at this point, but I guess after a beautiful Beale Street Music Fest, Memphis in May will have to deal with a potentially wetter barbecue contest. We'll have more on tomorrow's severe weather threat as the picture becomes clearer tomorrow morning via our social media feeds. Be sure to follow us on Facebook and Twitter and download the MWN mobile app for the latest information, including StormView Radar and our premium severe weather alerting tool, StormWatch+, which you'll find only in the MWN apps. Links to all of these can be found below. Mid-South weather over the past 10 days has been dry with moderate temperatures that have now become quite warm as highs have reached the mid 80s. Humidity levels have also been very low but are now starting to rise as southerly wind has kicked in thanks to high pressure anchored to our east. The ground is becoming quite dry with only a bit over 3" of rain since the first of April and a trace in the past 10 days. 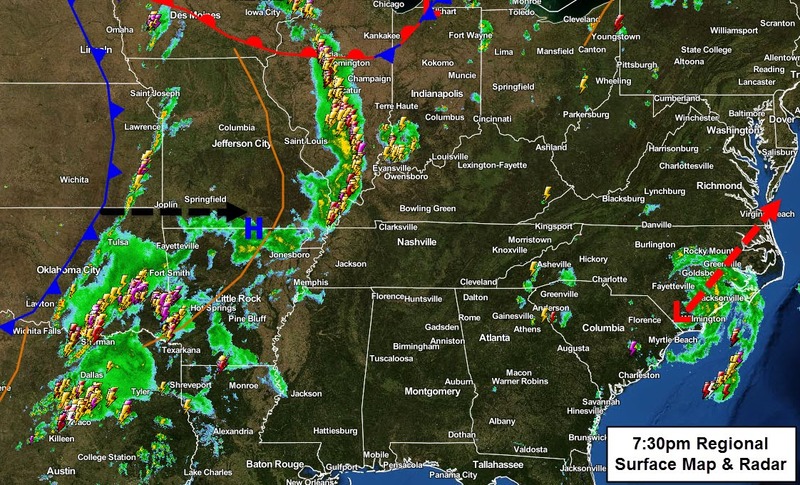 The main spring severe weather events the past several days have been over the central and southern plains. However, the main system that has been nearly stationary and responsible for the plains storms will eject east late this weekend. Ahead of that, waves of energy from the parent system will move towards the Mississippi River Valley over the coming days. Models disagree a bit on how far east the rain chances get, but I wouldn't be surprised to see a few showers or a thunderstorm tomorrow (Thursday) afternoon during the afternoon, and again on Friday. Potential rainfall amounts through Friday evening from NOAA. Most rainfall will stay to our west, but a few showers or a t'storm are possible the next couple of afternoons. Note also the heavy rain just offshore the Carolinas. More on that below. Rain and storm chances look a little higher Saturday, then diminish a bit by Sunday before the main system moves through on Monday with scattered to widespread showers and thunderstorms. 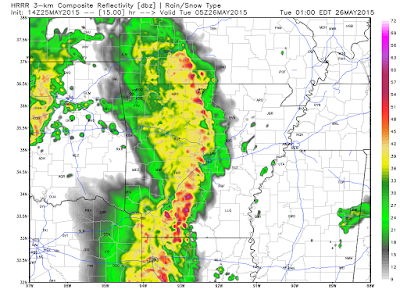 Severe weather threat is limited at this time, but we'll be watching Monday closely as the time gets closer. Temperatures will remain above normal with highs in the mid 80s (perhaps a few upper 80s this weekend if we get enough sun) and mild lows in the 60s. Normal highs and lows for this time of year are near 80 and 60, respectively. Potential rainfall amounts through Monday evening from NOAA. The Mid-South looks to receive 1/2"-1" of total rain based on this forecast with much more over the Plains where storms continue each day through the weekend. 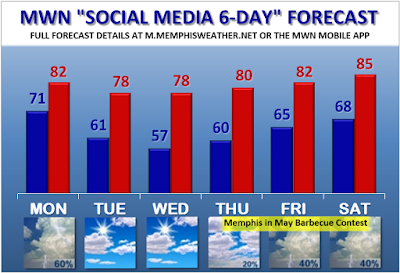 Once the main system exits early next week, I expect lower precip chances, cooler weather, and comfortable humidity levels on north wind heading into the middle of next week, just before the Memphis in May Barbecue Contest commences. Meanwhile in the western Atlantic, the first potential tropical disturbance is "on the radar" of meteorologists, despite the start of the Atlantic tropical season still over 3 weeks away. The storm, should it become a subtropical or tropical storm, would be called Ana and looks to affect the Carolina coastline this weekend with rain and wind, though the strongest part of the storm would be well offshore, at least initially. 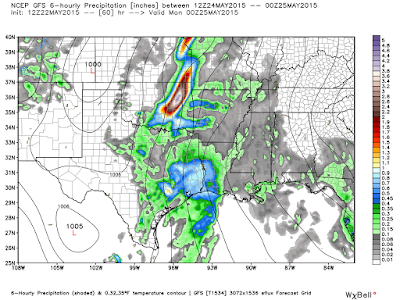 See the precip graphics above for possible rainfall totals. 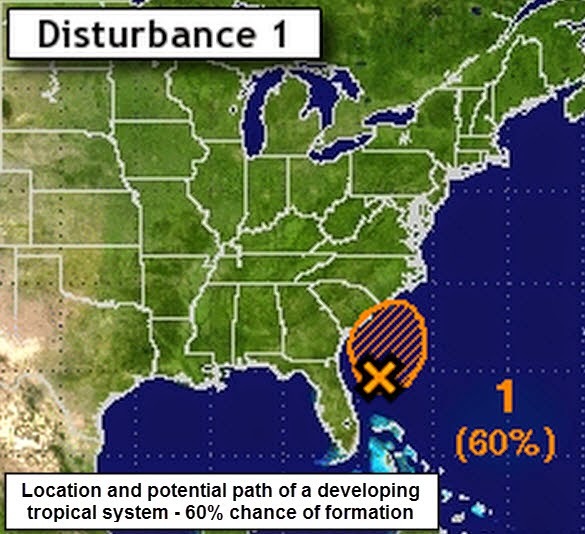 The first subtropical or tropical storm of the year could form by this weekend and would be named Ana. A new partnership for MWN! 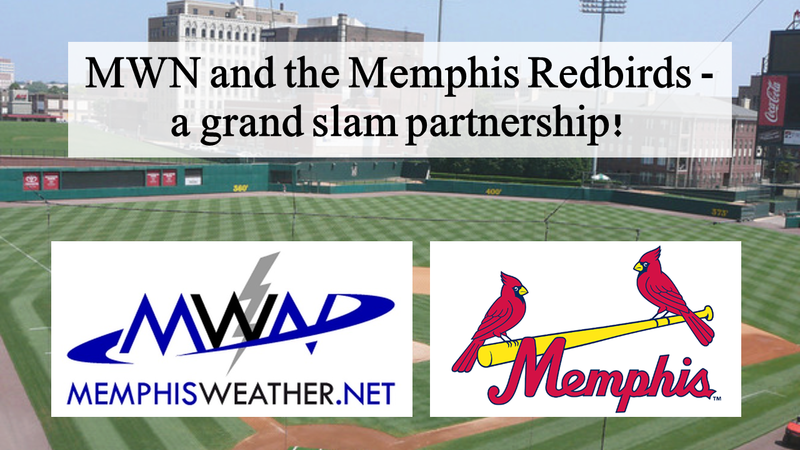 For those who have not read our announcement on social media or in the MWN Newsletter, MemphisWeather.net has partnered with the Memphis Redbirds to provide local weather updates as needed for the 2015 baseball season. We're very excited about this partnership and look forward to serving the Redbirds players and staff, as well as the fans in the stands, over the course of the season! For full details, click here. We have one more big announcement coming soon as well, but can't quite let the cat out of the bag just yet on that! Enjoy the "early summer" weather and be sure to have sunscreen on when spending more than just a little while outside over the coming days! The May sun, even with some clouds, is enough to burn you!